San Diego (CNN) – At first glance, the scene in Courtroom 2 might have seemed ordinary: Individuals presenting themselves before a judge one by one — some with attorneys, others without. The judge posing questions to each side and arranging follow-up court dates. But it was anything but ordinary. 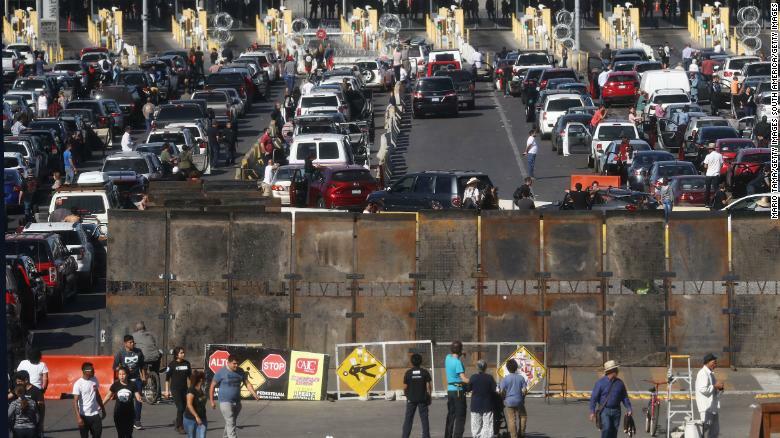 Migrants seeking asylum in the United States and forced to wait in Mexico expressed a fear of returning to Mexico, as the detention officers who transported them to the hearing stood idly in the back of the room. Lawyers tried to seek answers to what should have been basic questions from Immigration and Customs Enforcement attorneys, who seemed equally confused about the new administration policy keeping those migrants in Mexico. The program, which is only a few months old, marks an unprecedented change in US asylum policy for its requirement to keep some asylum seekers in Mexico for the duration of their immigration hearing. This month, those hearings got underway and raised a new host of issues with the controversial policy. Over the course of two days this past week, 18 men seeking asylum in the US shuffled into the San Diego immigration court escorted by detention officers. They were there for their master calendar hearings, the first hearing in removal proceedings. While the hearing itself was like any other, the line of questioning from immigration attorneys, immigration judges and, at times, the asylum seekers themselves revealed the uniqueness. Attorneys posed questions about where and how asylum seekers should submit their biometric information, which is necessary before their merits hearing, given that they’re waiting in another country. There were questions about where notification of a court date should be sent since no fixed address is provided for the asylum seekers. And asylum seekers expressed fear of returning to Mexico. “I don’t want to return to Mexico, your honor,” an asylum seeker pleaded. The flurry of questions posed by all parties signaled the weight of the issue. “Getting this right is a matter of life or death,” said Lindsay Toczylowski, an immigration attorney based in Los Angeles who’s representing two asylum seekers. For asylum seekers who fall under the MPP program, the process is as follows: Customs and Border Protection is instructed to refer migrants who claim they’ll be persecuted or tortured in Mexico to US Citizenship and Immigration Services for further interviews; asylum officers are then expected to conduct follow-up interviews in person, via video teleconference or by telephone. If migrants don’t meet the threshold, they’ll be expected to stay in Mexico until their immigration court proceedings. To attend the hearings, migrants, predominantly from Northern Triangle countries, presented themselves at the San Ysidro port of entry the morning of their hearing. Immigration and Customs Enforcement then managed the transport to and from the border and the San Diego immigration court, roughly 18 miles from the port of entry. Four uniformed officers wearing vests emblazoned with the words “Detention Officer” accompanied the migrants as they passed through security at the court and lined up against a white wall in the waiting area. Dressed in everyday attire, they waited patiently before entering the courtroom where their proceedings would take place. A little more than an hour before their hearings, asylum seekers were provided time to meet with lawyers in the courtroom — a new necessity given that they’re staying in Mexico and have limited access to lawyers based in the US. But key to those meetings is confidentiality, attorneys argued, which they said was not afforded to them in the confines of the room. Across both days, lawyers tried to spread out, using every inch of the small room, even sitting on the floor to talk to clients, Toczylowski said. Attempts to move to a different room on a separate floor in the building were unsuccessful. As they met with lawyers, the detention officers slipped in and out of the room, unsettling immigrants in the waiting room attending their own hearings. “Seeing detention officers scares clients,” said Aisha Ching, an immigration attorney whose client was unnerved by the officers. It wasn’t clear how the officers’ presence in the courtroom affected the asylum seekers throughout the hearings, but if it did, they didn’t appear to hold back their concerns about returning to Mexico or being properly notified of court dates. In one case, a man seeking asylum who did not have a lawyer said he had been given a list of legal service providers by the government but had trouble understanding it. There was also issues with conflicting dates on paperwork. According to documents reviewed by CNN, an asylum seeker who presented himself at the San Ysidro port of entry received paperwork that had two different dates — a date to appear before an immigration judge (March 20) and a separate date to appear at the port of entry (March 30). Theoretically, the two should match, given that an individual needs to appear at the port of entry before being transported to the court. He appeared on the correct date. The Department of Homeland Security acknowledged the conflicting dates in a statement. “Of the MPP hearings that took place, only two scheduling issues – which were easily rectified – have been reported,” a DHS spokesperson said in a statement. Asylum seekers whose cases were scheduled for Tuesday and Wednesday were either set up with merit hearing dates, where individuals provide evidence to substantiate their claims to remain in the US, or scheduled for a follow-up master calendar hearing to provide additional time to find legal representation. The dates were scattered between April, May, July and August. In some instances scheduling issues arose, as Simpson explained that his afternoons for the next several months are dedicated to master calendar hearings for Migrant Protection Protocols cases. Merits hearings, therefore, would need to be scheduled for the mornings. Given that asylum seekers must wait in Mexico, however, and therefore need time to be processed by US Customs and Border Protection before going to their hearings, mornings were out of the question. “Immigration officers need four hours,” said Robert Wities, an ICE attorney. “I can’t do an entire master calendar in the afternoon and merits hearing,” Simpson responded, later asking the ICE attorneys to explain in writing why it wouldn’t be possible for the asylum seekers to attend morning hearings. The Migrant Protection Protocols program was initially rolled out at the San Ysidro port of entry in January and has since expanded to other locations across the southern border. The Department of Homeland Security argues the program is among the many ways the administration is trying to address the spike of migrants arriving to the southern border. As of March 12, the US has returned 240 migrants to Mexico under these protocols. The first hearings took place on March 14, but only one of three asylum seekers arrived to the court. A glitch was presumed to be the reason for why the two other asylum seekers did not attend. Both were given another opportunity to appear before the court in the future. Some of the asylum seekers present Tuesday and Wednesday are also plaintiffs in a case challenging the MPP program. In February, a coalition of immigrant advocacy groups asked a federal judge for a restraining order that would block the Trump administration from forcing asylum seekers to stay in Mexico while their cases make their way through the immigration courts. The hearing on the motion happened Friday. The program is, in the meantime, expected to proceed, as are the hearings of asylum seekers who have fallen under the policy.